Sebastian Liseo is the architectural historian who runs Grand Homes Walking Tours for the Venice Museum & Archives. The tree and park-lined streets of downtown Venice were a part of John Nolan’s master plan. Morado de Sur (Dwelling Place of the South) is the oldest mansion in Venice, built in 1925 for George Webb, who was then the Chief Financial Officer for the Brotherhood of Locomotive Engineers. Though it is now an assisted living facility, the Hotel Venice was quite the attraction in the early 1920s. When you’ve been freelance writing for the Sun for as long as I have, you begin to think you know everything there is to know about the town’s storied history. But there’s nothing like taking a historic walking tour with a true expert to enlighten you as to how much you really don’t know. On Thursdays, though April 18, the Venice Museum & Archives sponsors a Grand Homes Walking Tour, with Sebastian Liseo, an architectural historian who has lived in Venice for almost 20 years. The group meets at the gazebo in Centennial Park at about 10:15 a.m. for the two and a half hour tour. The day I went, there were about 14 people on the tour, but Sebastian will run the tour with as many people who show up. He told me that one time, there were about 70 in attendance, so he just turned on a microphone and went on as usual, and I have no doubt he was telling the truth. Sebastian is an incredibly engaging and knowledgeable guide, mixing in humor and anecdotes in his delivery—so much so that you don’t even realize how truly educational his tour is. It’s such an enjoyable experience that sisters Lynn and Sue had taken this same tour with Sebastian last year, and brought their husbands Mike and Pat (respectively) to do it again with our group. As we gathered and signed in at the gazebo, Sebastian told us that during our tour, we would walk about 7,000 steps. That may seem like a lot, but you will walk very slowly and will stop often, as Sebastian points out architectural details like symbology, dentils and the influences of Andrea Palladio. The things he covers on the tour truly cannot be (safely) seen from a car, and even though you probably are well aware that our Venice got its name from the European Venice, it takes a tour guide who is very familiar with Italian architecture to point out to you where those influences have been implemented here. Sebastian was actually born in Italy and immigrated here with his family in the mid-50s. His brother and sister are buried there, so he goes back quite often. During his tour, he will refer to the architecture you see in Italian terms, and then will tell you exactly what it means, so besides learning about Venice architecture, you may come away with a little more knowledge of the Italian language. 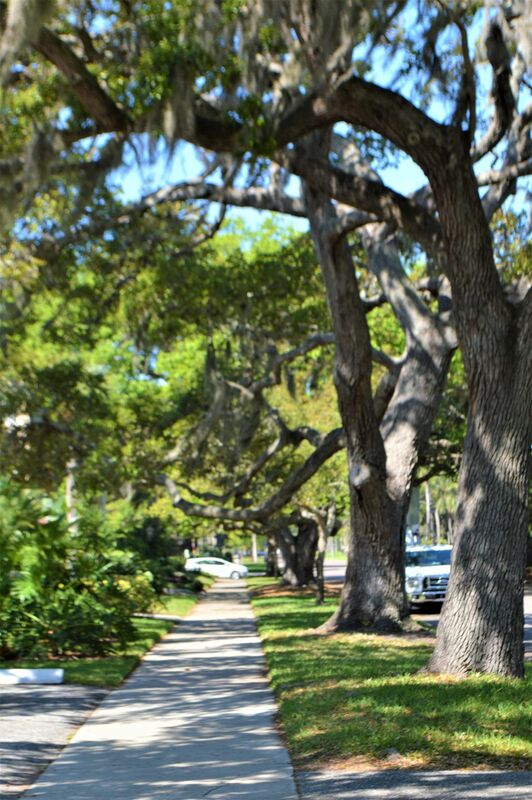 Venice, Florida was originally designed by John Nolen to be a walking city, and even today, it still is. In between the wide, tree-lined streets are grassy medians and lush parks. As Sebastian told us near the beginning of our tour, Nolen’s father had died when he was seven years old, and then his mother had given him to an orphanage. When he planned the design for Venice, he included space for parks every two blocks, because he wanted to be able to hear children laughing and playing, probably to compensate for not having that around when he was growing up in an orphanage. One thing is for sure, besides learning more about the settling of Venice, I was left with one lingering thought after my tour — I really need to find a way to get to the sister city in Italy very soon, so I can try out the new Italian terms I learned from Sebastian. WHERE: The Grand Homes Walking Tour leaves from the gazebo in Centennial Park, 200 W. Venice Ave., Venice. WHEN: The tours depart at 10:30 a.m. on Thursdays until April 18. Meeting time is at 10:15 a.m.
INFORMATION: It costs $20 per person to go on the tour, cash only. The fee is usually collected just before the tour begins, by a staff member of the Venice Museum & Archives, and includes a bottle of water and a 10% discount at the museum gift shop. The tour is easy walking, and all paths are wheelchair accessible. To find out more, or to reserve a spot on the tour ahead of time, email vmuseum@venicegov.com or call 941-486-2487.